Over three days during a hot and humid weekend in August, over 70 parents, staff, and community volunteers labored together to build a new playground at Murray Manor Elementary. The project was funded through a collaborative effort between KaBOOM!, a national nonprofit organization, the Murray Manor PTA (Parent Teacher Association), and the La Mesa-Spring Valley (LM-SV) School District, and took months of applications, fundraising, and construction planning. On Sept. 22, a ribbon-cutting event was held for the opening of a new playground at Murray Manor Elementary, celebrating its completion. Murray Manor Elementary, a highly-rated school in the LM-SV district, is also one of the oldest campuses, and lacked a modern playground. The open area next to the school was mostly a dusty patch of hard-packed decomposed granite — a place more likely to scrape a knee than inspire play. KaBOOM, which has a core mission of supporting safe play areas for all children, offers grants to communities and schools in need of playgrounds and provided most of the funding to purchase high-quality playground parts. They community is required to fundraise 20 percent of the costs, create a formal construction plan, and provide all-volunteer labor. The Murray Manor PTA submitted a grant application and it was accepted by KaBOOM. The PTA then contacted parents and began fundraising. The LM-SV district also provided funds as did the La Mesa Police Officers Association and La Mesa Heartland Firefighters. The school district — and in particular Assistant Superintendent for Business Services David Feliciano and Director of Business Services Valerie Ranum — helped supervise the installation. Starting on Friday, Aug. 25 and continuing through the following Sunday, teams of volunteers worked to unload pallets of materials, including over 30,000 pounds of concrete and 1,160 wheelbarrow loads of mulch, prepared the site, and then built the playground. PTA President Shane Steinfeld was at the center of these activities, working every day to ensure the project was completed. Steinfeld noted that it was hot and demanding work and that three sledgehammers were broken driving stakes into the rock-like soil. Despite the challenges, Steinfeld said he was amazed by how well groups from the community joined together to complete the project and was absolutely inspired by the hard work from all involved. Parents were assisted by volunteers from school staff, a local church, La Mesa Police and Fire departments, and the United States Navy. Finally, the work was finished and a shiny new playground stood in place of the bare dirt. After safety inspections, the formal ribbon cutting and opening was held on Sept. 22. Excited children were joined by many parents and all school staff. VIPs in attendance included La Mesa Mayor Dr. Mark Arapostathis, La Mesa Police Captain Matt Nicholass, LM-SV Assistant Superintendent Tina Sardina, PTA President Steinfeld, and Matthew Bagdasar from state Senator Joel Anderson’s office. PTA Playground Project Coordinator Michelle Monroy was chosen to cut the ribbon, which she did to wild applause and cheers from the crowd. Although Assistant Superintendent Feliciano was unable to attend the event, he stated he was honored to be a part of this PTA/school project. “Thanks to this grant and the generous donations of our parents, we were afforded the opportunity to truly partner with the community to create and physically construct something of lasting value for our children,” he said. 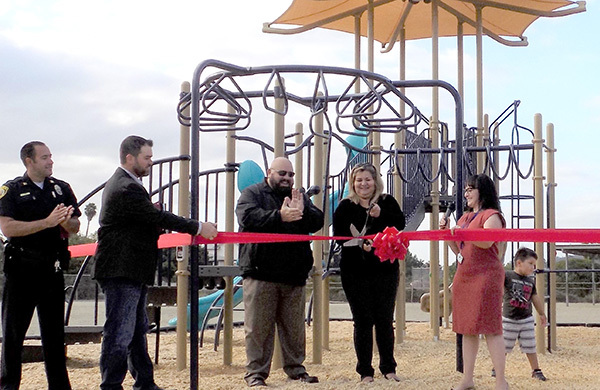 Murray Manor Principal Gina Miller echoed the praise for the work of the PTA and community and noted that the students were “beyond excited” for the opening of the new playground. Mayor Arapostathis, also a district teacher, said that Murray Manor was a model of a school with a strong partnership between staff and parents and this partnership allowed them to accomplish their goal and complete this project. “Our schools are what make La Mesa a wonderful city,” Arapostathis said. —Jay Steiger is a parent and school and community volunteer. Reach him at steigerjl@yahoo.com.